You may be shopping the Black Friday sales today, but you won’t find a better deal than the free non-profit webinars in our monthly round-up! This month, you can choose from among 22 free webinars offering insight and ideas on topics such as: Recruiting Members For Keeps; Grant Strategies; Leading Effective Teams; Nonprofit Tech Predictions for 2015; Creating Powerful Videos; and much more. Take a look through the list of webinars below and share this with your friends and colleagues. If we’ve missed a free non-profit webinar, please add a brief note in the comments. Everyone will receive a template stewardship plan to delight, retain, and upgrade donors and sample fundraising dashboard to stay organized managing your time and your portfolio. Start Your 2015 Grant Strategy Off Right! As the calendar year begins to wind down and you think about the new year, are you also thinking about how to strengthen your grant seeking strategy in the upcoming year? Participating in “Start Your 2015 Grant Strategy Off Right!” will provide you with a strong understanding of your success in 2014 and how to set goals for 2015 that will help expand your grant seeking strategy and revenue. We will also discuss how to successfully engage your colleagues in being part of the grant planning process for the new year. Teamwork is vital to the modern, interconnected workplace, yet many people have frustrating team experiences. This practical 4Good webinar will identify common misconceptions about teams that can result in practices that limit effectiveness. We will then identify crucial team skills, including: getting on the same page; running efficient meetings; communicating skillfully, and fostering mutual accountability for success. I will share real-life case studies; tips and tools; and resources for further learning. A free resource packet will be available on request. Common team practices that actually have limited effectiveness. Crucial skills and practices of high performing teams. Practical tips and tools you can put to use immediately. In this 4Good webinar for the beginner to the more advanced, Marcy Heim, author and development coach, challenges you to look at precisely HOW you determine and describe opportunities for your donors to invest in. A confused donor doesn't give, but the opportunity to choose from exciting options encourages enhanced giving at both the annual fund and the major gift levels. Marcy will have a worksheet for you to use in thinking this process through. How giving options fit into the Cycle of Successful Relationships. How the Strategic Plan and your Operations Fund lead to your Giving Options. How to use giving options to help a donor create the giving outcome that brings them incredible JOY! Question: What difference would it make for your organization if you could get $120,000 per year in free advertising? Good news: you can. Join VolunteerMatch and Eric Facas, founder and CEO of Media Cause, to learn the basics of the Google Ad Grants program. On Wednesday, December 3, 2014, Eric will walk you through how to take advantage of this free "perk," as well as strategies for getting started with your account. We'll also cover more advanced techniques including supporter growth, volunteer recruitment, and how this program could help supercharge your online engagement. The basics of Google Ad Grants and how your organization can join. Strategies for using Google Ad Grants to create tangible value for your organization. How to integrate Google Ad Grants with your communications programs to increase your online engagement and support. Are you tired of not having a plan every year? If this sounds like you, check out this WildWoman Fundraising webinar! In this webinar you’ll learn: How NOT to make a fundraising plan, Your One-Page Fundraising Road-map, Ideas for multiple streams of income, Earned income streams that work for nonprofits and more! Want to make 2015 your best year ever? A year where you work smarter, not harder to identify, grow, retain and upgrade your donors? Come get clarity and make 2015 your most profitable year ever! Join our special guest Rachel Muir, VP of Training at Pursuant for this Nonprofit Hub webinar dedicated to making 2015 your best year ever. You’ll get tips, tricks and tools to transform your fundraising to a new level. You don't have to be a designer or spend a lot of money to engage more supporters and raise more money online. We'll walk you through five important online fundraising best practices that can be quickly and easily implemented for fundraising season. We'll illustrate each using LightCMS, a website management tool available on TechSoup that requires no software to install and no server maintain. Executed properly, a sound donor relations strategy can increase donor retention, grow giving, and inspire current donors to positively influence like-minded future donors. Attend this Network for Good session with an open mind and a bend toward creativity to learn new and exciting ways to thank and inspire your donors while conveying impact of their giving. Bask in the glow of #GivingTuesday and other year-end giving opportunities and then immediately plunge into the good work of keeping them connected to your organization. Lynne Wester, the Donor Relations Guru, will share the messages and channels that are proven to be effective touches in donor relations. More and more development professionals are turning their attention to the single largest asset category for many of their donors, their real estate holdings. This 4Good webinar will review trends in real estate gift activity, the variety of real estate gift structures being used to fit particular donor situations, and emerging best practices across the country. Video is the most powerful communications tool in the 21st Century. During this CharityHowTo webinar you'll learn ways to turn video into visual storytelling so that it can work for your nonprofit to raise funds, build community, recruit volunteers, and incite action. You'll gain practical skills for creating video yourself and also understand what's involved in working with a professional video production company. This session will provide you with examples of successful use of video. You will also go behind the scenes to see some of the most important elements of great visual communications. This webinar will lead you through both the big, strategic decisions and the real-world how-to's of compelling video. Curious about what technologies may be coming down the road that can change the way nonprofits do business? How much will tablets take over in 2015? What about the move to mobile devices for your community? Join this TechSoup webinar to learn more about what tech is coming down the road that can help the social good sectors do more good! And which ones to hold off on investing in until they've shaken out the kinks. Grant funders love to support multiple-organization collaborations, which can achieve outcomes that no single organization can match. Sometimes, though, grant applicants are (understandably) less excited about collaboration, due to first-hand experience with unsuccessful or ineffective partnerships. This 4Good webinar, led by a veteran grant proposal writer who has coordinated several requests from multiple-organization collaborations, will share tips about how to leverage such relationships to get grants—while avoiding potential pitfalls. Better understanding of grantmaker expectations regarding collaborations. How to determine whether a collaboration is likely to succeed. Tips for working with collaborations to produce a grant application. Ways to resolve conflicts of interest that arise when seeking grant funds. Ideas regarding how to organically convene successful collaborations. 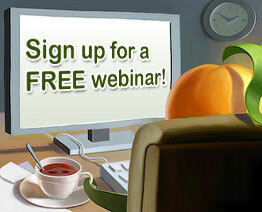 If your organization offers a free webinar that would be of interest to non-profit, membership or volunteer-based organizations and you want to include it in next month's post, please email a brief overview (like those above) to lori@wildapricot.com no later than December 18. Can rebranding really help you attract and retain donors? Board members? Clients? Will your staff be happier or communicate more effectively? Yes, it's all possible! In this free webinar, Big Duck's president Sarah Durham will walk you through the findings of a study that several hundred nonprofit professionals participated in. She'll share data and stories that will help you understand what to expect when you rebrand your nonprofit, including the variables that increase the odds of success, and more. Farra: Thanks for sharing that webinar with our readers. Thanks much for putting together this great resource and listing of all the webinars in one place! Please note, we are presenting a webinar with Trinet hosted by Bloomerang.